Yoani Sánchez blogs at Generación Y (desdecuba.com/generaciony) from Havana. 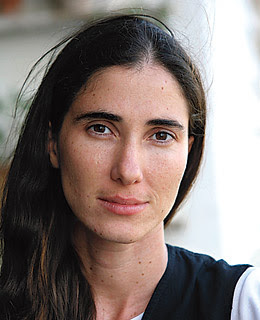 Yoani Sanchez was awarded the Premio Ortega y Gasset de Periodismo (Ortega y Gasset Journalism Award) in Spain but has not been able to get it because of the travel restrictions on Cubans by the Castros led Cuban regime. Recently, Fidel Castro singled out Sanchez out in his book on Bolivia. The ex-president Fidel Castro has just published a prologue of the book “Fidel, Bolivia and Something More” in which he denigrates the blog GeneraciÃ³n Y, which my wife writes on the internet. From the first day she has put her full name (which he omits) with her photo in view of the readers in order to sign the texts that she writes for the sole purpose, confessed repeated times, of vomiting everything in our reality that nauseates her. I make this clarification because I remember perfectly well that it was the author of these reproaches who put (or ordered put) the Order of JosÃ© MartÃ­ on the most terrible and undeserving of all possible lapels: Leonid Ilich Brezhnev, Nicolae Ceausescu, Todor Yivkov, Gustav Husak, Janos Kadar, Mengistu Haile Mariam, Robert Mugabe, Heng Samrin, Erich Honecker and others that I have forgotten. I would like to read, in the light of these times, a reflection that justifies those inappropriate honors that, to drive the water of other mills, sullied the name of our apostle. What a courageous young woman!